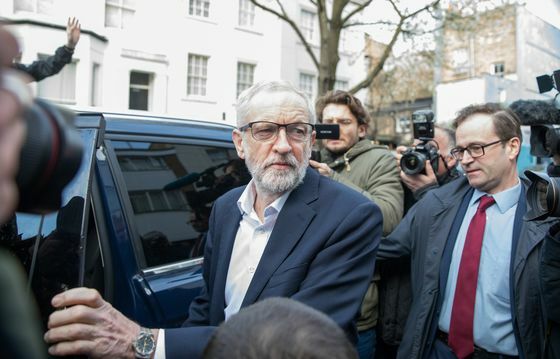 U.K. Prime Minister Theresa May is hoping to re-start stalled Brexit negotiations with her chief political rival Jeremy Corbyn, in her search for a compromise plan she can sell to European leaders at a crucial summit this week. Over the weekend, May defended her decision to work with the main opposition Labour Party leader to help draft a new blueprint for leaving the EU. Despite their differences, she warned that without Corbyn’s support, Britain might never leave the trading bloc. But the talks appeared to be stuck, with no face-to-face meetings over the weekend and none planned for Monday, according to people familiar with the matter, speaking on condition of anonymity. Britain is in the grip of a political crisis, with Parliament deadlocked and unable to agree a plan to leave the EU. The country was due to depart on March 29 but couldn’t get a deal agreed to in time. This week, May is hoping EU leaders will give her a second short extension to the Brexit day deadline, until June 30, so she can carry on trying to get her plan through Parliament. It’s more likely that the bloc will insist on a much longer delay -- which would spark a furious revolt and potentially resignations from pro-Brexit British ministers. 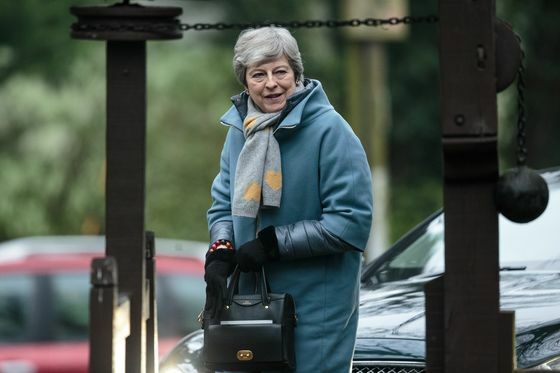 The cross-party talks in London show no sign of resolving the stalemate so far, but May has been aiming for a breakthrough before she heads to Brussels for a summit on Wednesday. While May’s requesting an extension, she says that if MPs agree to a deal, the U.K. should be able to leave before European Parliament elections are held on May 23. 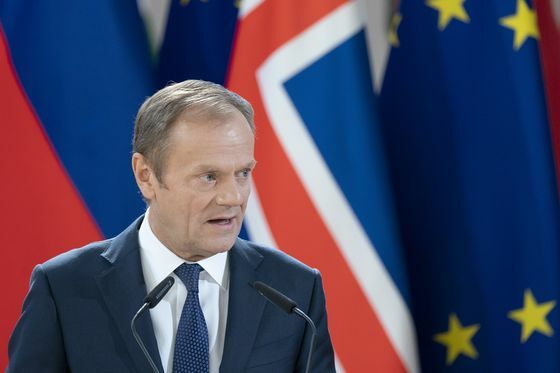 European Council President Donald Tusk, however, is pushing for a delay of as long as a year to allow time to forge a new consensus -- with an option to leave earlier once the withdrawal agreement is ratified by the U.K. Parliament. One leading Conservative lawmaker, Chief Secretary to the Treasury Liz Truss, underscored the pressure on the prime minister both at home and in Europe, warning Sunday in a BBC radio interview that accepting a long, flexible extension would be “like purgatory” for Britain. On Monday, debate is set to resume in the House of Lords on a draft law aimed at forcing the government to seek an extension to avoid a no-deal departure. The bill raced through the House of Commons in a single day on Wednesday but was held up in the House of Lords on Thursday. May is battling to contain a backlash from within her Conservative Party over her decision to work with Corbyn, someone she’s spent three years deriding. Inviting him into the process is “a mistake,” prominent pro-Brexit lawmaker Jacob Rees-Mogg said in an interview with Sky News on Sunday. “There is an irony, at the very minimum, of saying one week that one thinks Mr. Corbyn is dangerous and unfit for office, and the next week deciding to co-habit with him,” he said. The Labour leader wants May to negotiate a permanent customs union with the EU, something she’s previously ruled out on grounds it would stop Britain doing trade deals with countries outside the bloc. In her video address, the premier emphasized that compromises will be needed on both sides to get a cross-party agreement. Brexit campaigner Andrea Leadsom gave May some cover to move on the question of a customs union in an interview with the BBC on Sunday. She was backed up later in the day by Solicitor General Robert Buckland, who signaled to BBC radio that while a customs union does have "some real drawbacks," it could provide a way forward. "It does mean we deliver the end to freedom of movement and it does mean that we deliver the vast majority of, I think, the aims of Brexit," he said. "It’s not perfect, but frankly in this particular hung parliament none of us can get perfection."